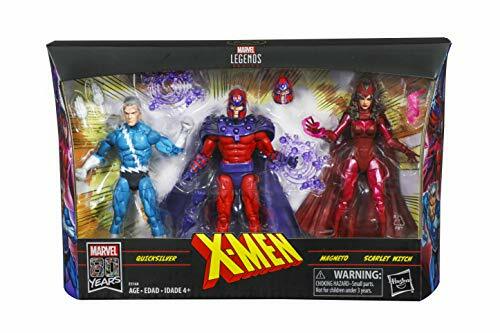 6-Inch scale collectible Magneto, Quicksilver, and Scarlet witch: revel in the momentous showdown between the X-Men and their most formidable adversaries yet: Magneto, and the dynamic brother-sister duo, Quicksilver and Scarlet witch, with these 6-inch scale figures. Premium articulation and detailing: featuring premium deco and multiple points of articulation for high pose ability, fans and collectors can display the Marvel Legends series Magneto, Quicksilver, and Scarlet witch in their collection to recreate scenes from Marvel Comics. Marvel universe in 6-inch scale: look for other Marvel Legends series figures, (each sold separately) including Captain America, Iron Man, Thor, and more, to build a Marvel Legends figure collection worthy of recognition. (Additional figures each sold separately. Subject to availability).